Lift your SCANGRIP Multimatch Light sky high! SCANGRIP Telescoping Tripod, manufactured using steel construction and finished with a high-quality powder coating, securely attaches to your SCANGRIP Multimatch light to bring your work space illuminations to new heights. 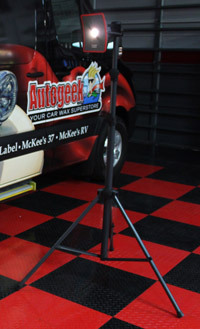 With a maximum height of 10 feet, SCANGRIP Telescoping Tripod is a great choice for lighting hardware in your detailing garage or shop. SCANGRIP Telescoping Tripod extends to 10 feet high for all-over illumination! *Multimatch light sold separately. Sold separately from the SCANGRIP Multimatch light, the SCANGRIP Telescoping Tripod allows you more versatility in your work area. Swirls, scratches, and other paint imperfections won’t be able to escape you with your SCANGRIP Multimatch so high up! SCANGRIP Telescoping Tripod has a durable construction with locking joints for added security. The tripod legs allow for easy storage and mobility – simply fold and store when you’re done! The SCANGRIP Telescoping Tripod and SCANGRIP Multimatch light are available in a money saving combo, the SCANGRIP Multimatch Tripod Single, but if you already have the light and you are looking for some versatility, the SCANGRIP Telescoping Tripod is just the tool you need! *SCANGRIP Multimatch light sold separately.